The campus of the University of North Carolina has been host to its fair share of history since the school’s foundation. As the oldest public university in the United States, there’s plenty of history to talk about — from some of the first men in space learning to navigate by stars in Morehead Planetarium to a Cold War-era bunker that housed a supercomputer. The World War II era is continually fascinating, for historians and the general public alike. In 1932, Frank Porter Graham was elected President of the entire UNC system, a position that he held for 17 years. Graham would eventually serve on United Nations Commissions and in the United States Senate, but following the events of Pearl Harbor in 1941, he began to push UNC-CH toward supporting the war effort. 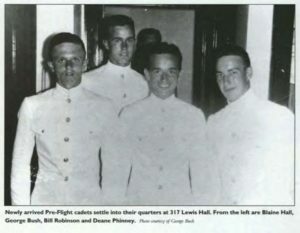 Graham has served in WWI, and lobbied for UNC to stage a Navy Pre-Flight Training program. One of four schools selected nationwide to host young up-and-coming pilots, UNC also housed several other military support schools and programs, from a Marine training unit to an Army geography and language study program. UNC’s language departments began to teach Russian and Japanese as the entire United States pulled together to fight in multiple theaters of war. Among the over 18,000 men who lived and learned at UNC during WWII, there are no shortage of notable names. The future president of France, Charles de Gaulle, was a French cadet who was smuggled out of France as his country surrendered to the German war machine. John Glenn, Gerald Ford, Ted Williams and Paul “Bear” Bryant passed by the Old Well, and George H.W. Bush spent time walking the campus of Blue Heaven. Bush’s mother recalled letters from her son, telling of Barbara’s visit before she married George. 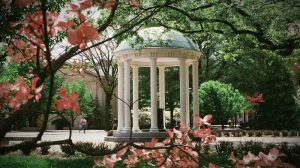 He spoke to her of touring the campus with his future wife, a picnic lunch and getting caught in the rain in a grove of pine trees close to Kenan Stadium. Physical reminders of the militarization of UNC and an entire nation mobilized for war across two oceans can be seen in the still-standing ROTC armory and memorial on Cameron Avenue between Phillips and Memorial halls, and memories like the ones shared by George H.W. and Barbara Bush hold just as much – if not more – value.